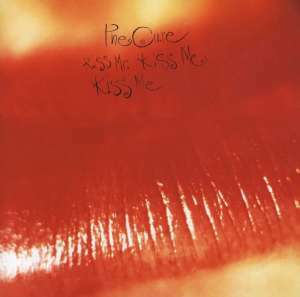 Kiss Me Kiss Me Kiss Me was released in may 1987: Robert Smith’s lips, portrayed on the cover, are the symbol of a record that, as a whole, both seduces and fascinates. The ten weeks of recording spent in the epic “Miraval” studios create a spell: the starry nights, the floods of alcohol, the isolation from the rest of the world allow for the birth of a very close bond between Robert Smith and his companions; the best context for the creation of a prodigious album. The leader of the Cure welcomes the artistic contribution of all members of the group and, in fact, teamwork is the cornerstone that supports the structure of Kiss Me Kiss Me Kiss Me and makes it the most heterogeneous of their whole discography. It consists of eighteen tracks that recall a dark and tortuous past and lead us to more pop sounds: The Kiss opens with four minutes of sinuous guitar, before Smith’s tormented voice reaches us. It will be defined by the author the “unhealthy side of lust”. Soon after, Catch, poetic and measured, is quite uplifting. The alternation of dark tracks and more delicate tracks is precisely what creates the perfect balance where words cling to music and the atmosphere finds its paraphrase in the lyrics. A Thousand Hours, a combination of strings and keyboards, is the song of a heart that seeks peace, but follows Shiver and Shake, a song full of hatred towards to the ex Cure “Lol” Tolhurst (ousted from the group because of his drug abuse) that, with its provocative rhythm, pushes us to share all Robert Smith’s contempt. The tracks depict a succession of contradictory scenarios: the painful echoes of If only tonight we could sleep shatter on the radiant notes of Why can’t I be you. Just Like Heaven, a memorable guitar riff, is the track that contains the swirling evolution of the entire album: it speaks of love, of the warmth of a dream, of darkness and of a graceful nostalgia. At the end of the record, kissed by feelings of death and excesses, of passions and tenderness, we feel “as weird as angels” and we imagine ourselves circling on a cliff overlooking the ocean. Kiss me Kiss me Kiss me is a sentimental experience that you would like to repeat immediately and, in December of 1987, the Cure fulfil our wish by reissuing it in 3 33” that includes the six singles’ b-sides, including Breathe and A Chain of Flowers, precious gems to listen to with your eyes closed, to go back to dancing in a dreamlike landscape made of sighs. “I am certain of nothing but of the holiness of the heart's affections and the truth of the imagination. What the imagination seizes as beauty must be truth - whether it existed before or not - for I have the same idea of all our passions as of love: they are all, in their sublime, creative of essential beauty ...” (John Keats) Laura Codenotti was born and lives in Brescia. She graduated in Art History and has always cultivated her passion for writing. 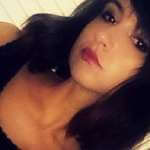 She is fond of Dickens novels, Romantic poetry, New Wave and Post Punk music culture, and photography. Books give her the thousand lives she would live, her endless journey.